On behalf of my family, I extend our sincerest condolences on the grievous loss you suffered when Jay was killed. To the Cullen family, fellow officers, and all who call Jay beloved, my heart goes out to all of you and may you find comfort in your loved ones and your strength in your faith. When my son was killed, the entire law enforcement community in our area embraced us in a circle of love and support, and I know you will receive the same support. It makes the unbearable less torturous, and I pray for your solace. I hope that your family knows that a nation mourned for you. Today I was given Lieutenant Pilot Henry John Cullen’s III name to wear his name in honor of National police week. EOW 8/12/17. Im a 911 Emeregency communications specialist for the Lakeland Police Department. Over 18 years of service continue. It’s my honor to recognize you sir and honor you and your family. Thank you for your service. I pray you are with my father in Heaven ... perhaps fishing. It was my honor today to take a moment and remember those officers that sacrificed their lives in the the line of duty, and it was my distinct privilege to have Lieutenant Cullen's name on my wrist and to have have his memory with me as we rode 50 miles of beautiful country side in North Houston on our bicycles. Thank you for the honor and thank you for your sacrifice. My condolences from Oklahoma. Rest easy brother we have it from here. 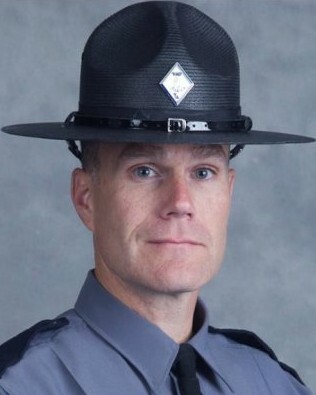 My sincerest condolences go out to the families and all the lives touched by both Jay Cullen and Trooper Berke Bates. Jay was my first flight instructor when I attended Randolph-Macon Academy. He was, by far, the most influential instructor I've had in my career. Mind you, I began flying at the age of 14. He showed incredible patience and just had the "knack" of instilling genuine confidence. He helped me maintain determination and confidence when I was severely injured and had to fight to keep my dream alive. Although he was my instructor, I considered him a friend and certainly someone that played a crucial role in my life. I lost touch with him a few years after I left R-MA and actually I was just recently trying to track him down for the shear purpose of thanking him. Thank you from the bottom of my heart. One of my most cherished memories will always be you jumping out of the plane after landing, flipping me the bird in jest with a smirk before my first solo. Tailwinds Jay. Thank you for your service and sacrifice and may you rest in peace. God bless you and your family. For your act of unselfish bravery and courage Lieutenant Pilot Cullen, we salute you. Blessed are the peacemakers. My family and I would like to extend our sincere condolences to the family, friends, and fellow coworkers of Lieutenant Pilot Jay Cullen during this very difficult time. May they find comfort and support from those around them. May their times spent together bring forth happy memories to last a lifetime. May God help heal their aching hearts. Thank you for your service and dedication to your community. Rest in peace Lieutenant Cullen. Thank you for your service and sacrifice. God be with the families involved. I have lifted your family to God every morning for over six years. I pray that Jay's life and death will bring glory to His name. Rest In Peace brother! From your BLUE family at the Palm Bay Police Department. I'm sorry that you have left us in a whirl of hate and bigotry. When you took your oath to protect and serve you chose to protect and serve everyone; all colors, all religions, all beliefs and you fulfilled your oath with honor. Rest now. Let those of us who believe that your effort was not in vain or your life wasted but voice to ending hate. Rest now but keep an eye on us would you? We so appreciate the service of Lt. Jay Cullen in protecting Charlottesville and the citizens of Virginia. Rest in Peace, Sir, and know that we respect you enormously. God bless Lieutenant Cullen's family, friends and coworkers and give them strength and peace to get through their grief and pain. Thank you for your service Sir!